Construction of the 8.5-mile Crenshaw/LAX Line continues moving forward this month with more activities along the light-rail alignment that will run between the Expo and Green lines as it travels through the Crenshaw, Inglewood and LAX communities. In the northern segment, excavation of the Crenshaw/Expo underground station has reached a depth of 40 feet and will continue to 80 feet. Other activities currently taking place include construction of a shaft elevator to support construction activities and work on underground utilities. 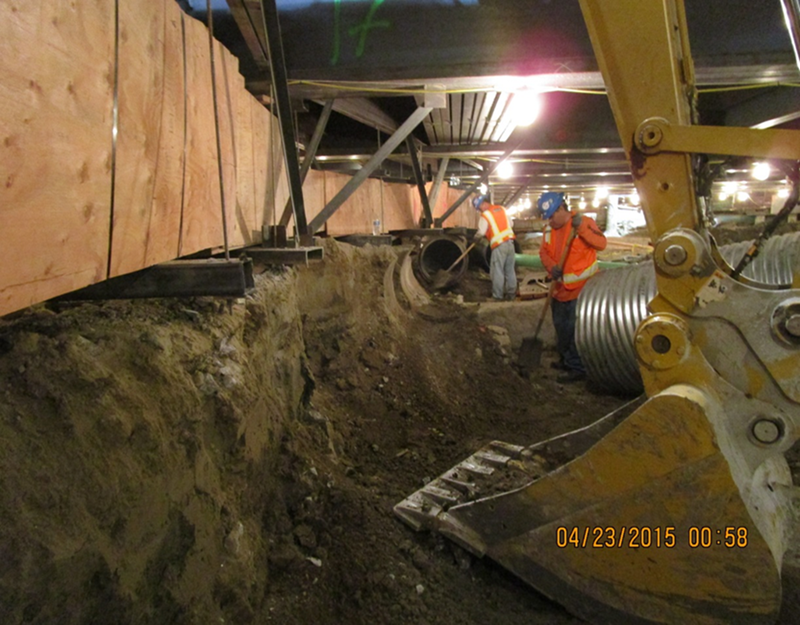 This underground station excavation has reached a depth of 25 feet in some areas. Meanwhile utilities are being secured and jet grouting for the perimeter walls continues to take place. The contractor Walsh/Shea Corridor Constructors (WSCC) will begin a 12 consecutive day full street closure of Crenshaw between 43rd Street/Homeland Drive and Vernon Avenue, beginning at 9 p.m. Sunday, June 7, to excavate and deck the third and last of the underground stations. WSCC has been pot holing and installing steel beams on the east side of Crenshaw Boulevard to create the perimeter walls of the tunnel exit at Park Mesa Heights. In July construction will move to the west side of Crenshaw. Excavation and decking on this segment will take place in midsummer. WSCC has scheduled for mid-June a traffic reconfiguration here to create a working space with concrete barrier to initiate pot holing to discover unmarked utilities, followed by steel beam installation for this underground segment. The tunnel will be a cut and cover operation, so a tunnel boring machine won’t be used. Work is beginning on the permanent closure of Victoria Street to create a cul-de-sac at the north side of Metro’s right-of-way. This operation will take place by the end of June. 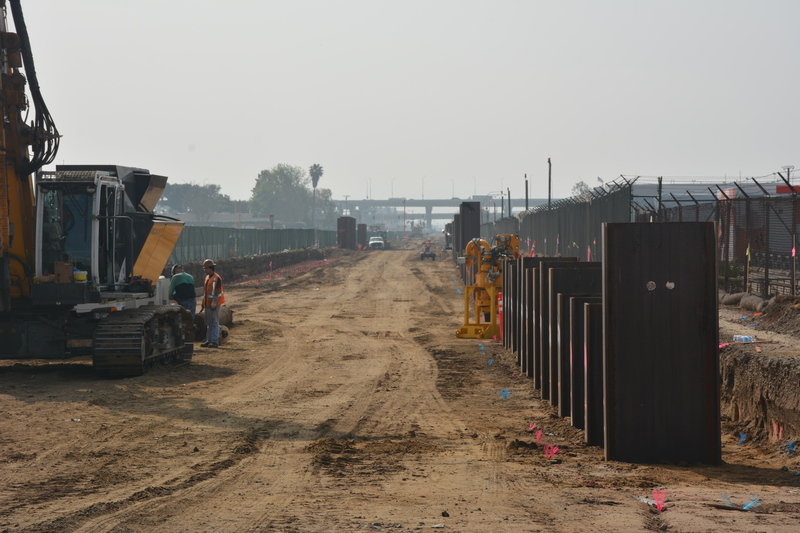 WSCC has begun welding rail tracks on the right-of-way on the north side of Florence Avenue between Redondo Boulevard and Centinela Avenue in Inglewood. Construction work on the La Brea Bridge continues. This month WSCC will begin building the falsework for the abutments or support columns for bridge that will cross La Brea Avenue. The contractor will install a crosswalk and create parking space on the west side of La Brea. An eight-foot banner is being erected at Faithful Central Bible Church to create a visual barrier near where construction work will take place later this month for a pedestrian tunnel between the church parking lot and the church main building. Preliminary construction work will begin in mid-June for the bridge that will cross over the 405 freeway at Florence Avenue and La Cienega Boulevard. WSCC will install concrete barriers to create a work area. By the end of June WSCC will begin building falsework for the abutments or support columns for this third bridge in the Inglewood area. It will cross over Manchester Avenue, just west of the intersection of Aviation Boulevard and Manchester Avenue. Also in June the contractor will begin building the superstructure for the aerial Aviation/Century station. There will be a two-week, one lane closure. The first week on the west-bound lane and the second week on the east-bound side. Exact dates will be provided as soon as possible. Decking of the underground segment between 104th Street and 111th Street, adjacent to LAX’s southern runway, will begin by the end of this month. Lane closures on Imperial Highway and Aviation have been scheduled for June to build the elevated segment to connect with the Metro Green Line. Metro Bus service near these construction activities may be detoured. Metro put up posters in advance when bus routes are temporarily changed. All construction activities, dates and times are subject to change at the last minute. For more information on the Crenshaw/LAX Transit Project go to metro.net/Crenshaw or join us on Facebook at https://www.facebook.com/CrenshawRail and on Twitter at https://twitter.com/crenshawrail or call the project hotline (213) 922-2736. Where will a boring machine be used, if at all? Yes, the tunnel boring machine is expected to be lowered by the end of the year inside the Crenshaw/Expo station and soon after begin drilling south towards Crenshaw/MLK station and then Crenshaw/Vernon station. Crenshaw/LAX Transit Project will open in 2019.